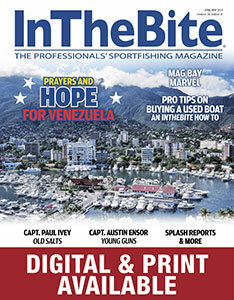 April/ May Issue– HITTING THE DOCKS NOW. 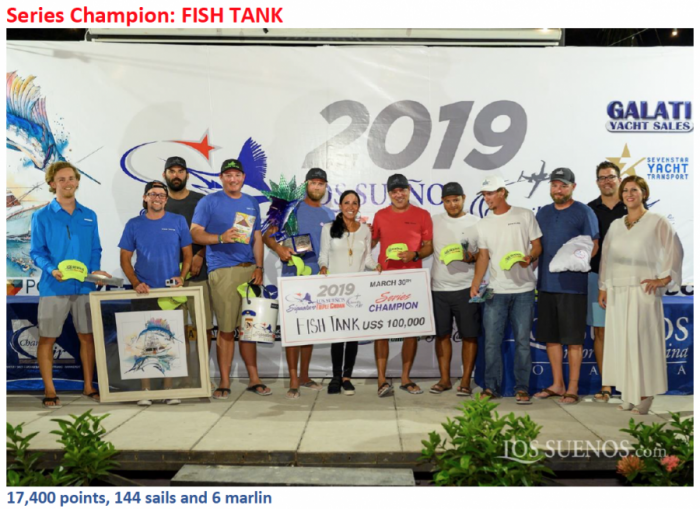 Fish Tank was the clear and undisputed Series Champion of the 2019 Los Sueños Signature Triple Crown, finishing with an almost unbelievable 17,400 points (144 sails, 6 marlin). Kudos to the team and especially to Laura Jessen who, despite a broken foot, released 6 sails this tournament alone and 34 sails over all three legs! 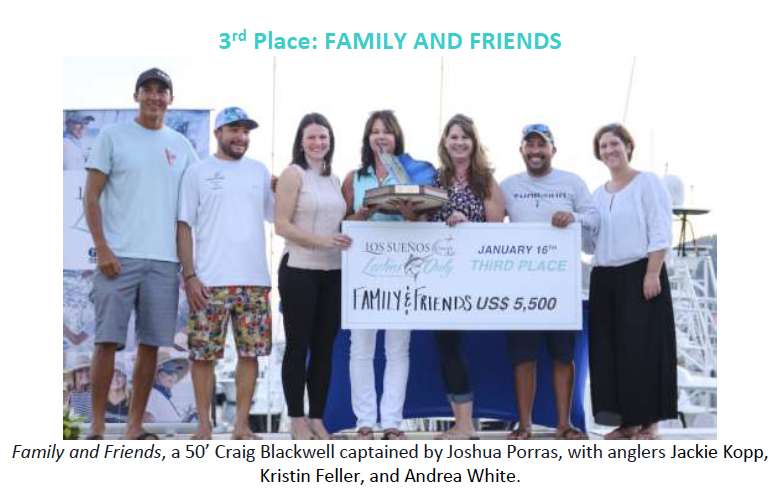 Los Sueños Resort and Marina, located at Playa Herradura on Costa Rica’s Central Pacific Coast, held the third and final leg of its sixth annual Los Sueños Signature Triple Crown billfish series, presented by Chantilly Air, March 27-30, 2019. 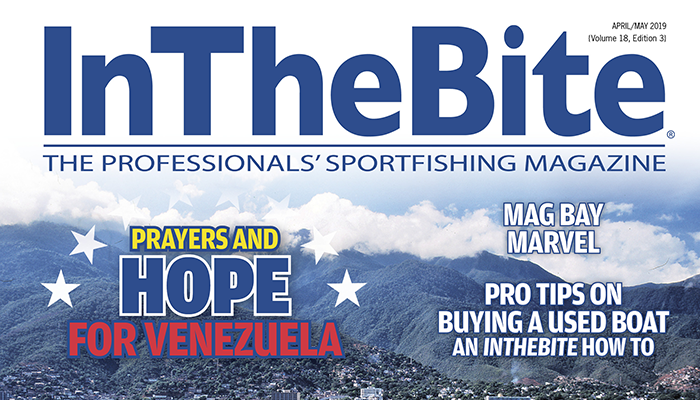 Forty seven of the best and most competitive teams came together to release a total of 1,234 billfish over three days. 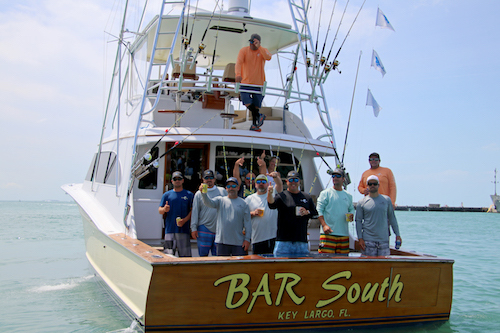 Final Sail is Back: Who Will Be Named Crown Jewel of Sailfishing? Miami Beach, Fla. (Mar. 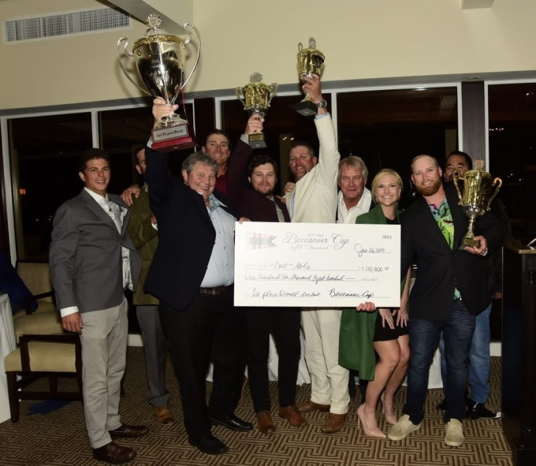 18, 2019) – The party moves south, as the highly anticipated grand finale of the Quest for the Crest Sailfish Series, Final Sail, closes out in Miami Beach this year on April 3-7. A hefty purse in excess of $800,000 is not the only prize teams have their eyes on. 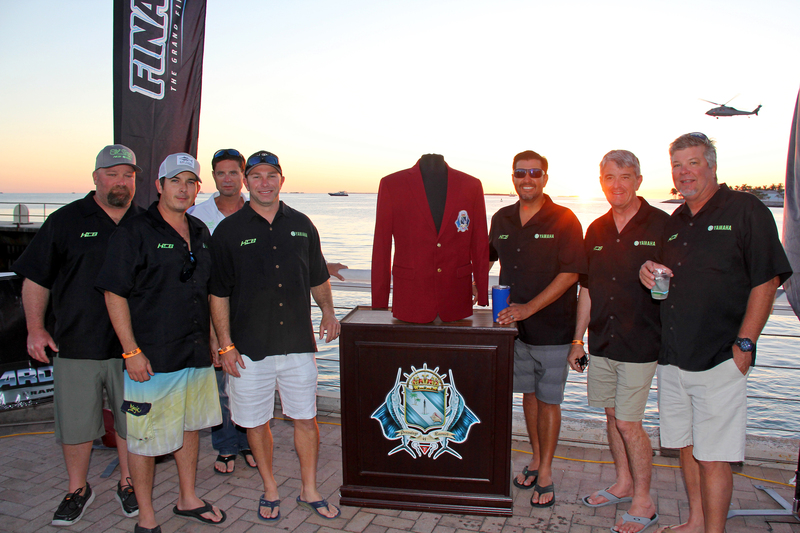 The prestigious burgundy jackets are also awarded to the top overall team at this final leg of the series. With an elite fleet of competitors, this world title is as tight as the lines, but the leader will be cut soon and just one team will claim their spot in the competitive sailfishing hall of fame. Major payouts aren’t the only attraction for teams at Final Sail. 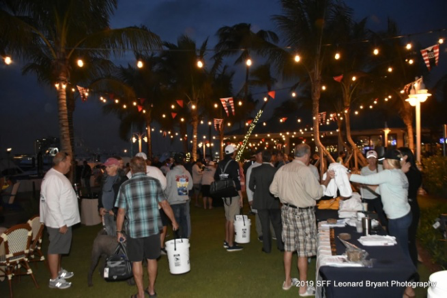 This grand finale takes place in Miami Beach, with an exciting kick-off party overlooking beautiful Biscayne Bay and a Resorts World Bimini sponsored “Casino Night” where anglers compete on the green felt to help raise money for the tournament charity, Fishing for Muscular Dystrophy. The kick-off party is held Wednesday, April 3rd at the incredible DoubleTree by Hilton Grand Hotel Biscayne Bay. With a “day of rest” in between, competition starts on Friday, April 5th with lines in at 8 a.m. Following lines out on day one, teams can unwind for happy hour at the famous Monty’s Restaurant in Miami Beach Marina with complimentary drinks and food. Day two of competition is Saturday April 6th and tensions will be high as the final scores determine both the winners of Final Sail and the Quest for the Crest series. 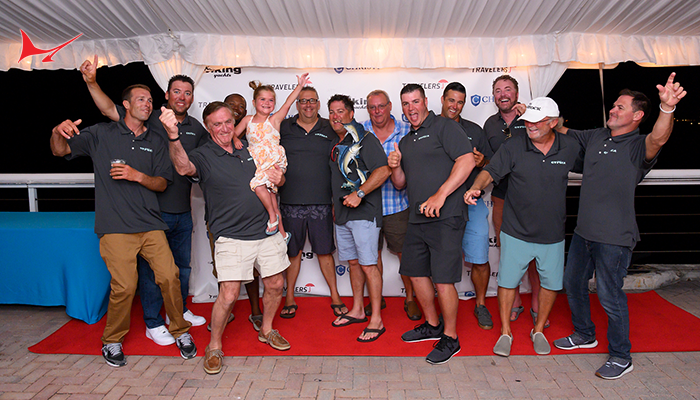 With a total purse exceeding $1.9 million dollars, several boats have claimed six figure prizes at each stop for the series. 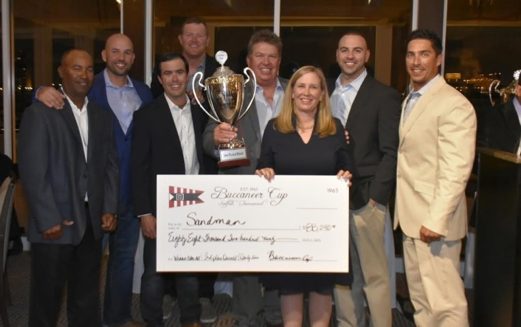 With a current payout approaching $350,000 and a winner-take-all format, the Release Round Up has the undivided attention of every team and many spectators heading into Final Sail. Run the table in Final Sail and your team will have a shot at a payday in excess of $500,000. 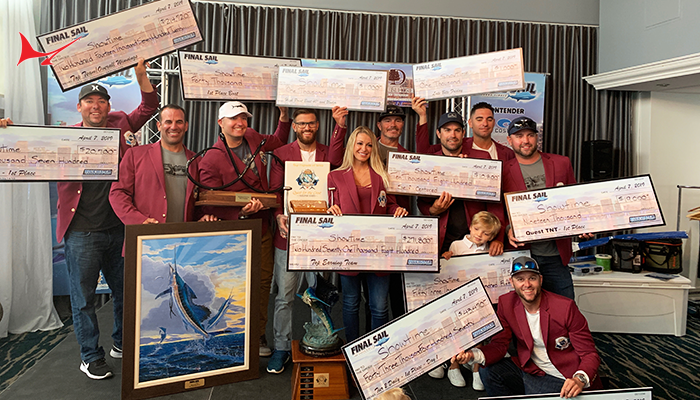 Five teams were in arms reach of the jackpot in the last tournament, Sailfish Challenge, and two of those teams needed just two more releases to win the massive jackpot. The signature category is broken into four rounds of fishing (morning and afternoon) over the two-day competition. In each round, a random number between 1 and 6 is drawn at the start of the round and represents the minimum number of sailfish a team must release during the 4-hour round in order to advance to the next. A team must advance through all four rounds and have the most releases in the final round among their competitors in order to claim the jackpot. The results of the first two legs in the series have been diverse, with Utopia taking first place for Operation Sailfish with 14 releases, MDALA only a release behind with 13, and Kluch/Reel Easy taking 3rd place with 12 releases. Sailfish Challenge was a nail-bitter to the end. Native Son, one of the final five in the Release Round Up at the Challenge, secured 1st place with 20 releases. Team Good Call followed closely behind in 2nd with 19 releases and Kluch/Reel Easy snagged back-to-back 3rd place finishes with 18 releases. 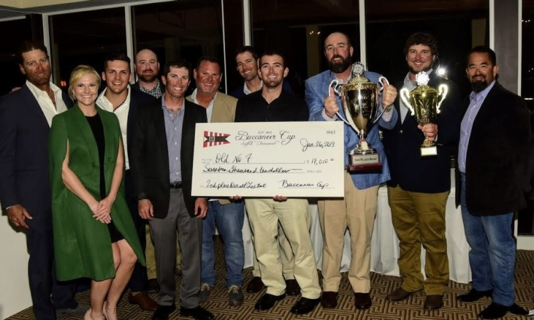 Their consistent performances earned them the lead in the series standings with 56 points followed by Bar South in 2nd place with 51 points, and one of the center-console favorites, team Showtime in 3rd place with 49 points on their 39’ SeaVee. Claiming the world champions title and the burgundy jackets requires dominant performances and most importantly – consistency. As the final sailfish tournament of the season, teams know what is at stake. Who will rise to the occasion? The 7th annual Final Sail will be one to remember and the tournament of the season you won’t want to miss! The Final Sail kick-off party is held on Wednesday, April 3 at the beautiful DoubleTree by Hilton Grand Hotel Biscayne Bay in Miami Beach. Competition days are both Friday, April 5th and Saturday, April 6th, followed by an awards ceremony Sunday, April 7th at the DoubleTree Grand Hilton Hotel ballroom. Tournament registration is available online at www.FinalSail.com and remains open until the conclusion of the kickoff party on April 3rd. 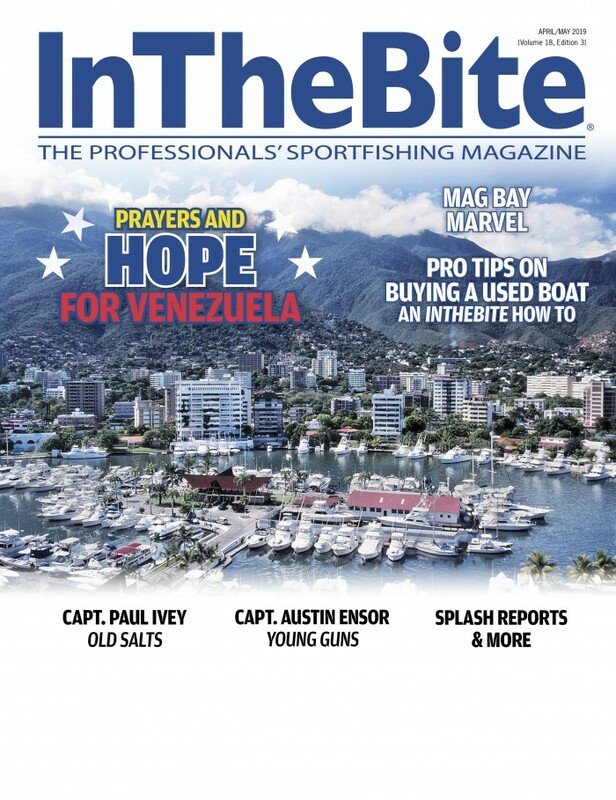 March Issue 2019: Hitting the Docks Now! Ready for a Spring Break? 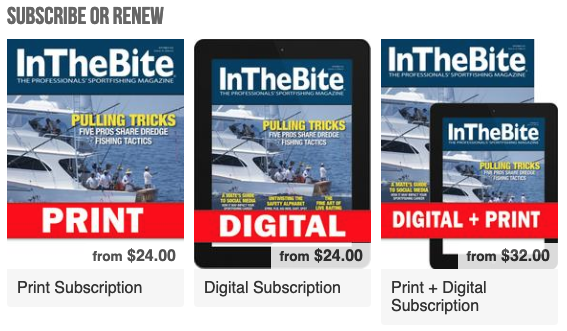 Check out the March issue of InTheBite, hitting the docks now! 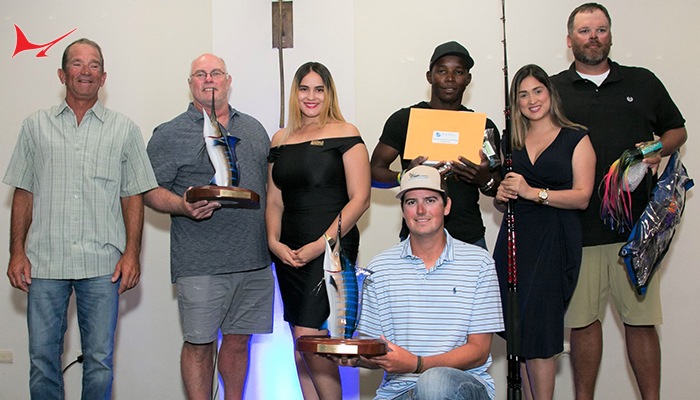 KEY LARGO, Florida Keys — Team Seraphim of Ocean Reef, led by Captain Jerry Pohl of Miami, Florida, tallied 12 sailfish releases to take top honors at the two-day Billfish Championship, a main event of the Jimmy Johnson Fishing Championship Week that ended March 9 in the Florida Keys. 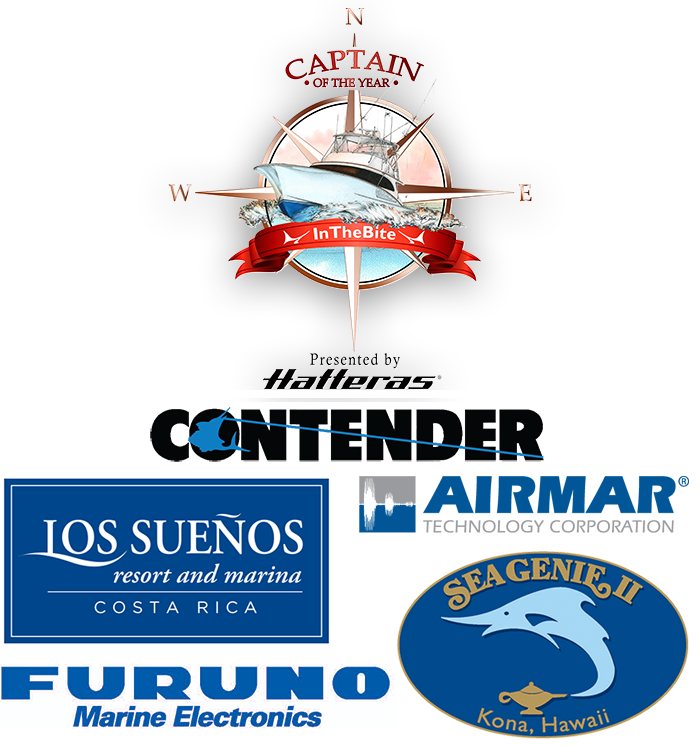 Kicking off this year’s Los Sueños Signature Triple Crown with the 1st annual Ladies Only Tournament Los Sueños Resort and Marina, located at Playa Herradura on Costa Rica’s Central Pacific Coast, held the first leg of its sixth annual Los Sueños Signature Triple Crown billfish series, presented by Chantilly Air, January 16-19, 2019. 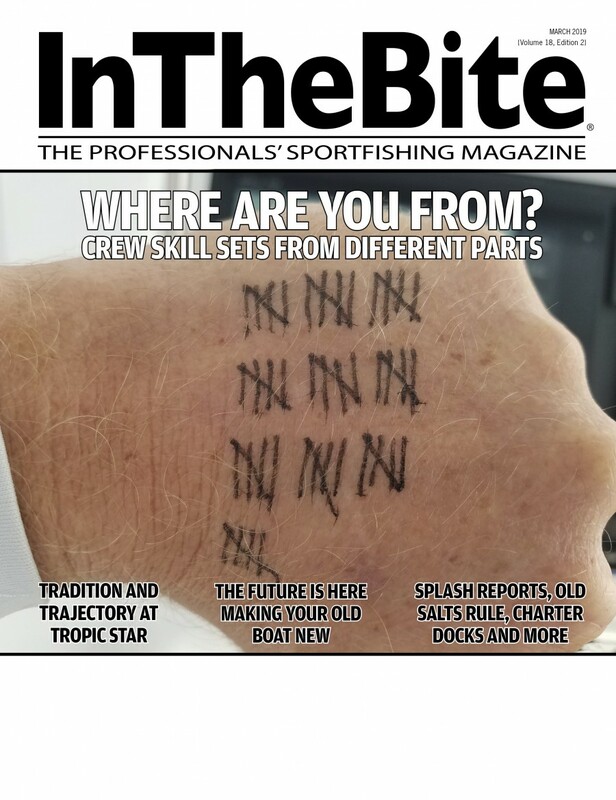 A total of 44 of the world’s most competitive billfishing teams comprised of 210 individual anglers challenged each other over three days of fishing, releasing a total of 648 billfish, including 582 sails and 66 marlin for a per boat average of 15 billfish releases. 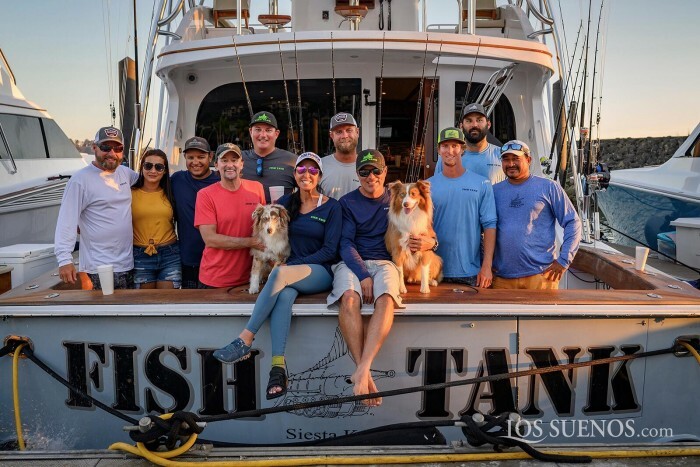 Held on Tuesday, January 15th the first annual Los Sueños Ladies Only Tournament, presented by Chantilly Air and sponsored by Maverick and Galati Yacht Sales, brought together 49 individual anglers participating on 17 boats. It seemed like a clear battle between Family and Friends and D.A. Sea who were tied both for points and on time just half an hour before lines out. Fish Tank (anglers Laura Jessen and Michelle Keeney) surprised everyone though, calling in a marlin hook up which they went on to release at 4:04 pm for the win, having released 8 sails and 1 marlin for 1300 points. D.A. 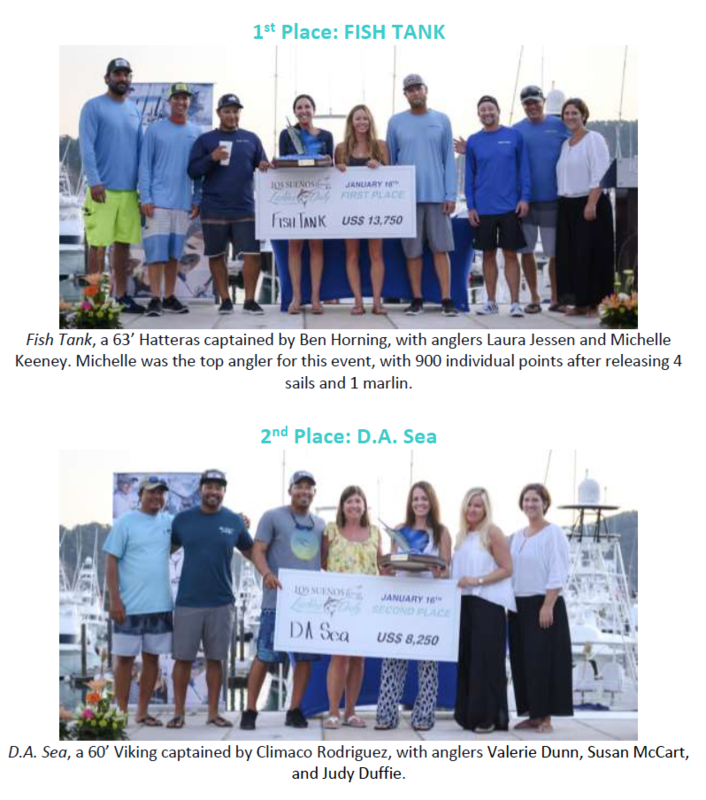 Sea (anglers Valerie Dunn, Susan McCart, and Judy Duffie) ended up second with 1100 points with 6 sailfish and 1 marlin release, and Family and Friends (anglers Jackie Kopp, Kristin Feller, and Andrea White) rounded out the leaderboard in third with 1000 points after releasing 10 sails. Awards were presented the following day and the ladies took to the stage to receive their cash prizes and trophies, sponsored by Gray Taxidermy. A total of $27,500 was handed out, 50% going to first, 30% to second, and 20% to third. Individual angler points follow the ladies through the Triple Crown and will be tallied to their total scores from that event to determine the Top Female Angler Overall. So far, Jackie Kopp of Family and Friends is well in the lead with 700 points from the Ladies Only and 1500 points from the first leg of the Triple Crown. It was Numero Uno who fittingly released fish “numero uno” of the tournament at 8:05 am on Day 1, January 17th. 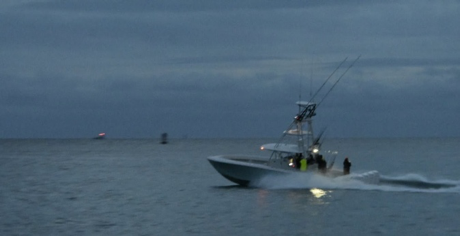 By 10:00 am the competitive fleet of 44 teams and 210 anglers had released 89 billfish, including 84 sails and 5 marlin. Tarheel took an early lead with 800 points, over The King and I and Blue Eagle, each with 700 points. The King and I showed their stripes early with 1800 points by noon, taking a 600 point lead over Tranquilo with 1200 points and Outlaw with 1100 points. Over 40 fish were released in the next two hours, but the leaderboard changed very little, with The King and I releasing one more sail for 1900 points, Tranquilo staying steady with 1200 points, and Outlaw rounding out the top three, also with 1 more sailfish release for 1200 points. Although The King and I ended the day in first with 2000 points, there was definitely some jockeying in the latter part of the afternoon; Wire We Here ended up releasing 6 sails and 2 marlin for 1600 points and second place, and Blue Eagle released the same fish for the same points, just 13 minutes later to take third for the day. The King and I had a slow start to Day 2 with zero releases by 10 am, but managed to hold on to their first place spot. Wire We Here released four sails in the same period to tie The King and I with 2000 points, just 1 sailfish release and 100 points ahead of Reel Pushy. 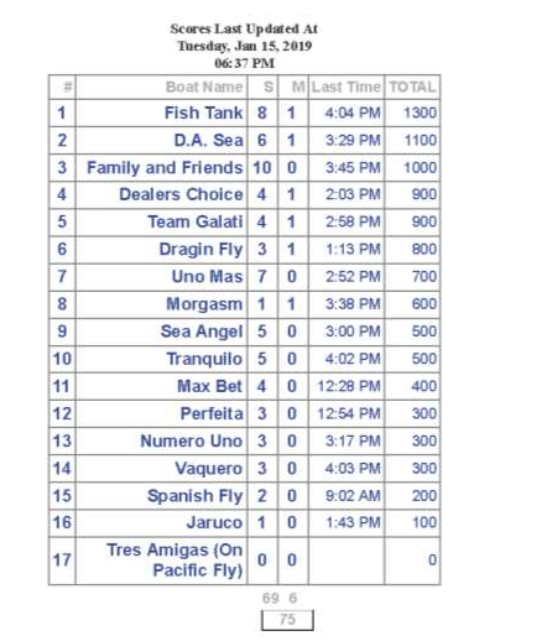 By noon the fleet had released a two-day total of 380 billfish and Fish Tank had pushed The King and I down to third on time after Wire We Here, both with 2100 points, and taking top spot with 2300 points. Family and Friends were keeping their name in front of spectators, taking top spot with 2600 points by 2 pm, followed by Fish Tank with 2400 points and Reel Pushy in third with 2300 points. 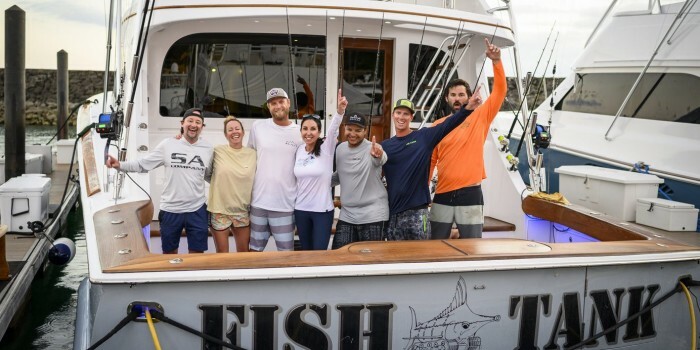 By the end of the day Family and Friends had earned enough points after releasing 7 sails and 2 marlin for a two-day total of 2600 points, to keep their first place position. 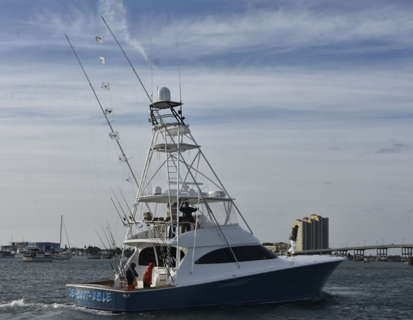 Reel Pushy released 7 sails and 2 marlin on Day 2 for a two-day total of 2500 points, and Fish Tank rounded out the top three with 2400 points after releasing 9 sails on Day 2. 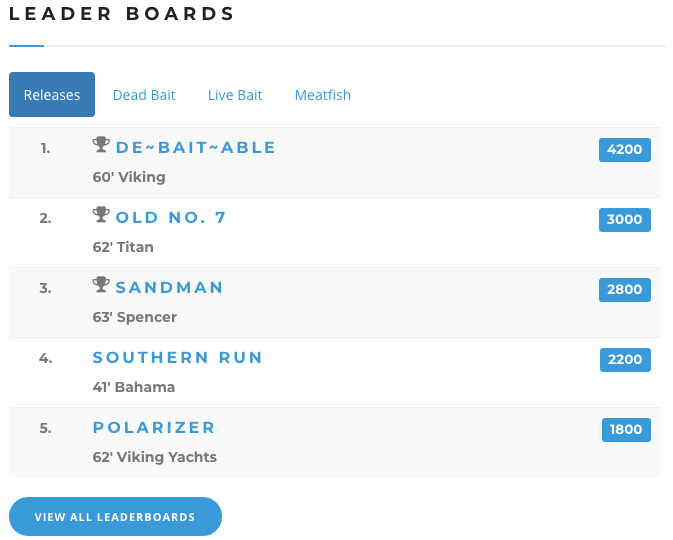 The top 9 teams were all within one marlin and one sail of the lead going in to Day 3. Day 3 followed the same trend as the first two days with a good morning bite. By 10 am the fleet had released 61 billfish for a three-day total of 522 billfish (469 sails and 53 marlin). The King and I were vying for the leaderboard and had amassed 3300 points to take first over Reel Pushy in second with 3100 points, and Tranquilo in third with 2800 points. At noon it was still anyone’s game. Fish Tank was in first with 3500 points. The King and I was in second, now with 3400 points, and Reel Pushy in third with one more sailfish for 3200 points. The 2 pm leaderboard would end up being a prediction of the Leg 1 finishers, showing Fish Tank in first with 4200 points, The King and I in second with 3400 points, and Reel Pushy in third with 3300 points. Fish Tank went on to release four more sails, ending the day – and the tournament – with 4600 points. The King and I and Reel Pushy kept the same points, Reel Pushy tying with Tranquilo on time, but releasing their last fish two hours before. 1,250 points include: Kona Throw Down, 1st Place; Firecracker Open, Heaviest Marlin, 667.5-pounds; Hawaiian Tournament Series, 1st Place. Congratulations to Captain Rob Ellyn for winning the 2018 Hawaiian Division Captain of the Year award. 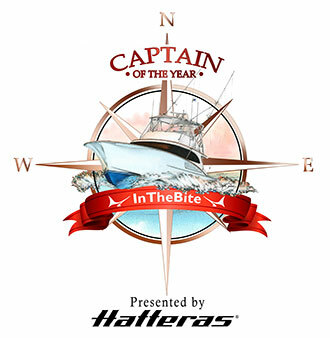 Ellyn, running the 47-foot Cabo Lightspeed out of Honokohau Harbor in Kona, is no stranger to the Captain of the Year (COTY) award or the winner’s circle. In the five-year history of the COTY in Hawaii, the captain has won the award twice, winning it in 2014 and 2108. The two-time COTY champion fished against a field of renowned Hawaiian captains. Winning the accolade twice, when fishing against notable captains such as Kerwin Masunaga, Marlin Parker, McGrew Rice, Stymie Epstein, Kevin Nakamaru, Carlton Taniyama, Gene Vanderhoek, Shane O’Brien, Teddy Hoogs and Jeff Kahl just to name a few, is quite an accomplishment. 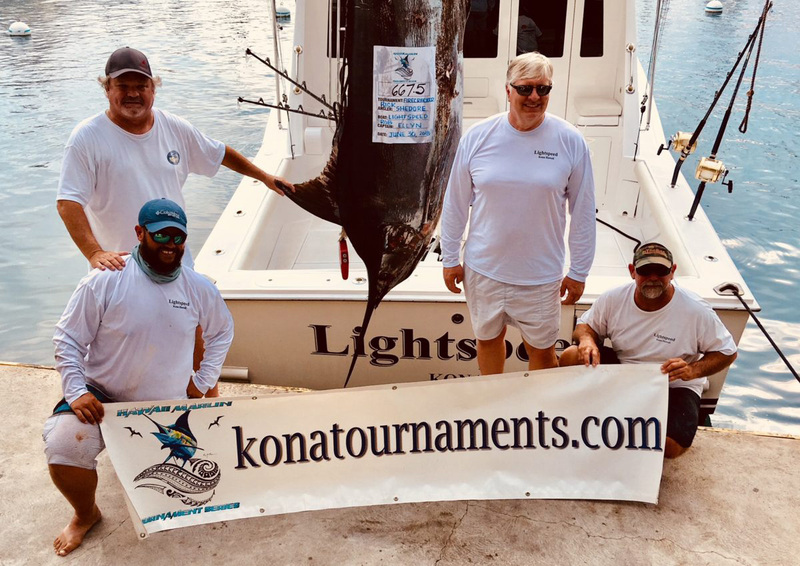 In 2018, InTheBite sanctioned 11 major tournaments in the calm, marlin-rich waters of Kona, Hawaii. Using the COTY scoring system, Ellyn won the honor by earning 1,250 total points. He racked up 500-points with the heaviest blue marlin, a 667.5-pounder, in the two-day Firecracker Open. He then won 500 first-place points by winning the Kona Throw Down, a three-day event that coincides with the World and Kona Cups, when his angler Rick Shedore tagged and released eight blue marlin. The day the tournament season ended, Ellyn had 1,000 COTY points and was tied with two other excellent Kona captains. Veteran Capt. Carlton Taniyama, on the Five Star, who won first-place in the Rock and Reel and the Lure Maker Challenge. Shane O’Brien on the Strong Persuader, a young captain who has been on fire in both Kona and Cabo the past couple of years. 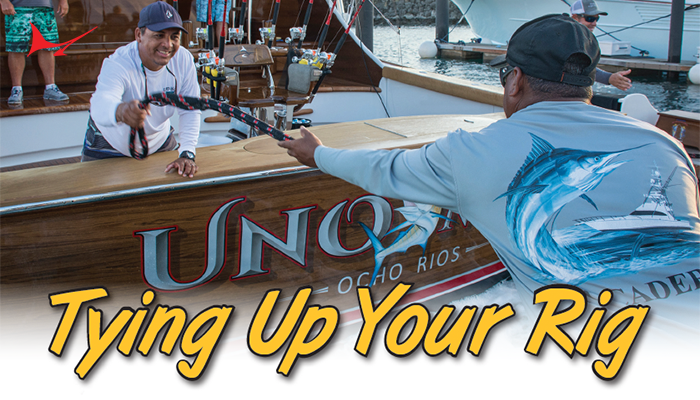 O’Brien won first-place points in Hawaii by winning the Skins Marlin Derby and the Big Island Marlin Tournament. 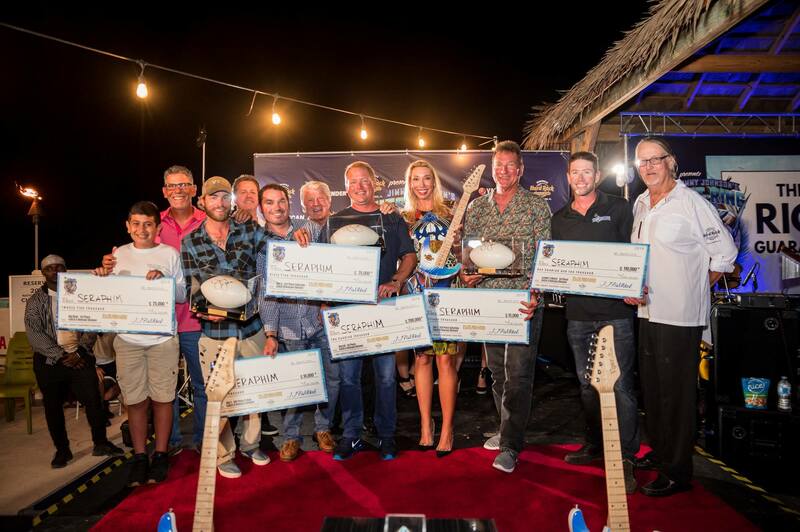 When the points were tallied for Jody Bright’s Hawaiian Tournament Series, a total of seven major tournaments, Ellyn won the Series top boat award, and Lightspeed angler Rick Shedore won the Series top angler. The 250-points for winning a tournament series put Ellyn over the top to win the COTY with 1,250 points. 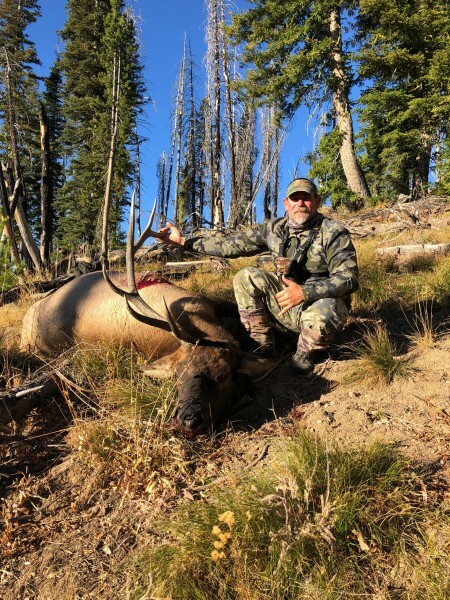 It is worth noting that Rick Shedore was the defending 2017 Series Champion angler as well. Congratulations to both Capt. Carlton Taniyama, on the Five Star and Shane O’Brien on the Strong Persuader. I would consider them in a second-place tie. Capt. Teddy Hoogs on the Bwana takes the third-place position with 900-points. The Lightspeed is armed with two great anglers, owner/angler Rob McCarthy and Rick Shedore. McCarthy and Shedore have only been fishing in Kona together for the past two years, but they have great chemistry. Ellyn has known Shedore for a long time. The two were good friends when Ellyn used to fish in Mexico. Ellyn says, “Communication is the key,” for the good juju onboard the Lightspeed. Congratulations also goes to the 2018 Lightspeed crew members, Travis Ota, Scott “Scooter” Fuller, and Chris Storrs. 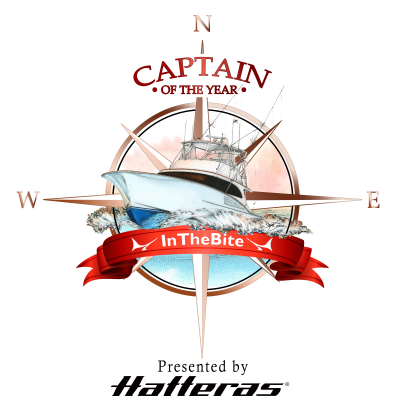 The 2019 Captain of the Year Cup presented by Hatteras is proud to announce a full slate of divisional sponsors for 2019. Contender Florida Division, the Los Suenos International Division, the AIRMAR East Coast Division, the Furuno Gulf Division, and the Sea Genie II Hawaii Division. ITB thanks all of the sponsors – stay tuned for an exciting year. Todd Davis won the 2019 Subscriber Giveaway to fish with Captain Glenn Cameron aboard the Floridian, a 60′ Sportsman, out of Stuart, Florida. Congratulations!